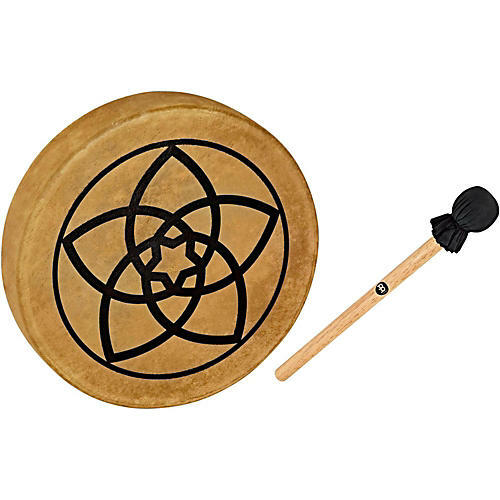 This Native American-style hoop drum from Meinl Sonic Energy is equipped with a hand-selected buffalo head for warm and powerful sound. It has a round, pleasant, earthy tone and a surprising dynamic range, as well as range of timbres and pitches. The construction of this drum is such that the hide skin is pulled around the back of the drum and laced across the middle for a traditional and adjustable grip. The frame itself is sturdy and lightweight, made with premium fiberglass. Includes a leather padded wooden beater. This one bears the Venus Flower design.